Here all the drop forgings made in our company are closed die forgings, not open die forgings, so we will need to make dies first before drop forging. The material of drop forging dies is die steel, such as H13, P20, ect. In our factory, you will first see an individual machining workshop with lots of CNC center. Just as you see,it is our dies workshop. All the dies for drop forgings are made by ourselves, so comparing with other forging factory whose dies are outsouring made, we could offer you a more competitive die cost. Besides, it will be better for us the control the quality and production time. Really a wide choice to come to Fly Drop Forge! Before manufacturing, we just have drop forging drawing or sample at hand. So after order is placed, we will have to design dies with a series of points, such as dies size, gating way, parting line, cavities layout, ect. All these information will be showed in 2D or 3D drawings. According to the dimensions of drop forging, our engineer will design the main length, width and height of the upper and lower dies. Then start main rough machining with milling, drilling, lathe machines to get rough shape. Normally 0.15-0.3 mm machining allowance will be left for further machining. After rough machining, internal stress would be created, so the rough machined mould will be heat treatment. One is to remove the internal stress. The more important is to improve the hardness and other mechanical properties, so that it will work longer. 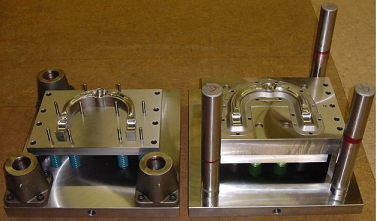 CNC machining is the key step to make dies, it will perfectly show how the dies are finished with designed dimensions, so the this process is much slower than rough machining.